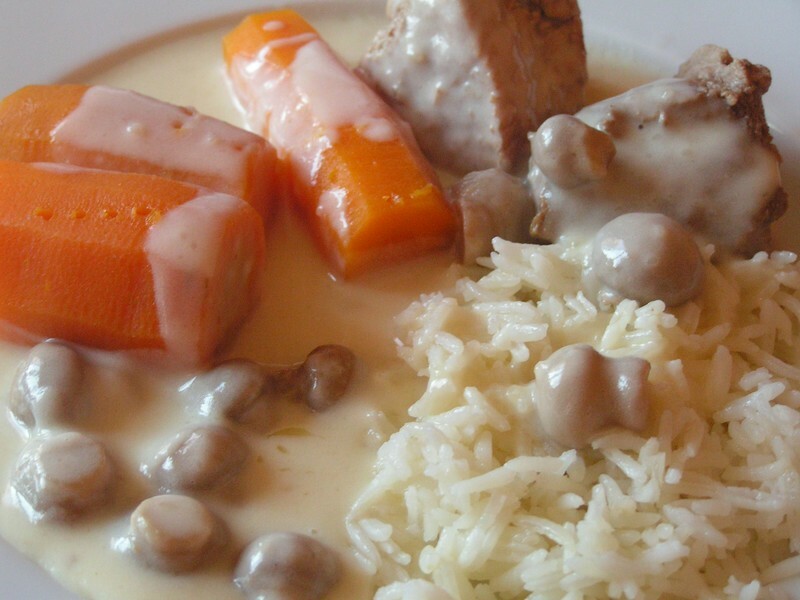 Blanquette de veau is a French veal dish. The term 'blanquette' comes from the French word for "white" (blanc), being a ragout (stew) with a white sauce. Other meats besides veal may be prepared 'en blanquette' (the traditional 'white meats' - pork, rabbit, chicken - as well as lamb) but blanquette de veau is the most famous example of this method. In a typical recipe, pieces of veal meat (shoulder, breast) and aromatic vegetables (onion, celery, carrot etc) are simmered at length in water or stock. The vegetables may then be discarded and the cooking liquid is thickened and enriched with flour, butter, cream and egg yolks. Mushrooms, rice, pasta and potatoes are common accompaniments to this dish, which is served hot.